Our GZDY vacuum belt dryers are specially designed drying devices that are intended for liquid and paste-like materials. This vacuum drying equipment is capable of continuously feeding and discharging these liquids and pastes by employing a powerful infeed pump that sends the material to be evenly spread onto belts by the distribution device. Under a high powered vacuum, the boiling point of the liquid is lowered so that the mixture can be heated to high temperatures, evaporating the water within and avoiding any mess caused by boiling. The vacuum dryer can use steam, hot water and hot oil as heat sources. The material moves along the belts where the product begins by evaporating and drying to cooling and discharging at the end. Near the discharging end of the drying machine is a special vacuum crusher that can be used to pack dry powder or granulated products automatically. This model of vacuum belt dryer turns traditional static drying to vacuum dynamic drying which significantly reduces drying times from 8-20 hours to 20-80 minutes. In the machine, the drying temperature is adjustable for different products with varying qualities. It completely solves the issue of high temperature spray dryers which can denature some materials due to long drying times of traditional drying ovens. The color, solubility and ingredient preservation from materials dried in the vacuum belt dryer are outstanding and the process cannot be duplicated using different techniques. 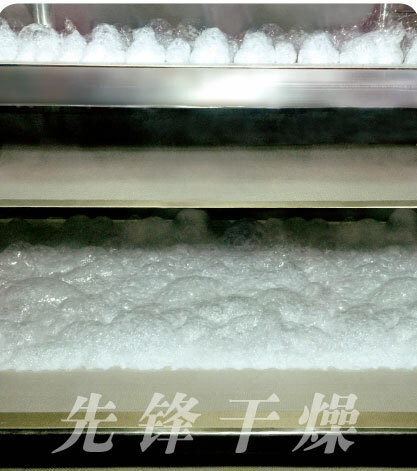 As the materials are gradually dried within a period of time after they are exposed to the vacuum conditions, the granules experience some crystallization. This creates micro-pores that enable the granule to be crushed into a desired consistency for processes such as tablet pressing or capsule filling. Vacuum belt drying technology has a large number of application possibilities. It is often used for extraction processes and it is especially suited for high viscosity materials that are easy to agglomerate. It is also the preferred technique for dealing with thermoplastic and heat sensitive materials. Using a vacuum belt dryer allows you to avoid defects with powders that are too fine or clumpy. The quality of finished products is easily controlled by making adjustments to the conveyor speed, material thickness, temperature, vacuum degree and other parameters of the machine. No matter the application, vacuum belt drying is far superior to spray drying. 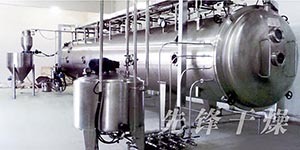 The vacuum belt dryer is mainly used in drying various liquid or paste raw materials, such as traditional and Western medicines, food, biological products, chemicalsl, health foods, food additive etc, The machine is especially suitable for drying difficult materials with high-viscosity, easy agglomeration, or thermal sensitivity. The dryer can handle materials that cannot be dried by traditional dryers. 1. 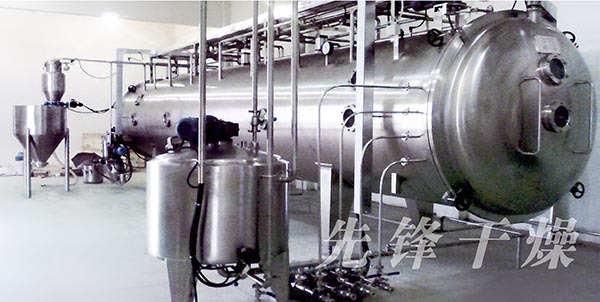 Pharmaceutical industry: Chinese medicine extracts, plant extracts, embryos, PVPK series, fermenting liquids etc. 2. Food industry: malt extract, carbohydrate, instant beverage, tea powder, cocoa powder, corn paste etc. 3. Chemical Industry: lithium battery, emamectin benzoate etc. If the solvent of raw material is organic (ethanol, acetone, methanol etc. ), evaporation capacity will rise. Evaporation capacity is closely related with drying temperature.